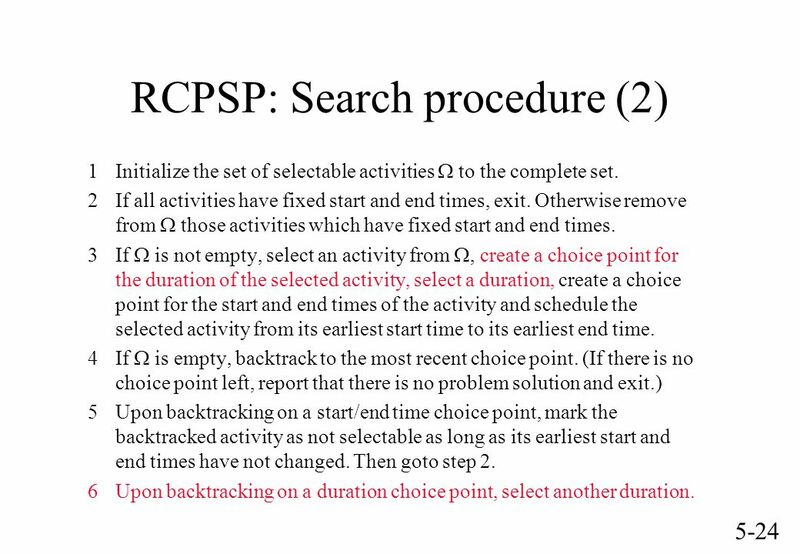 23 5-23 RCPSP: Search procedure (1) 1Initialize the set of selectable activities  to the complete set. 2If all activities have fixed start and end times, exit. Otherwise remove from  those activities which have fixed start and end times. 3If  is not empty, select an activity from , create a choice point for the selected activity (to allow backtracking) and schedule the selected activity from its earliest start time to its earliest end time. 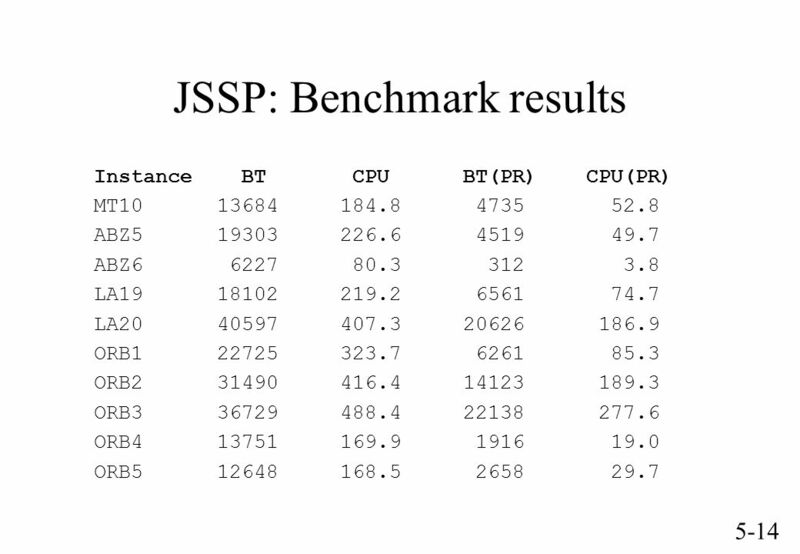 4If  is empty, backtrack to the most recent choice point. 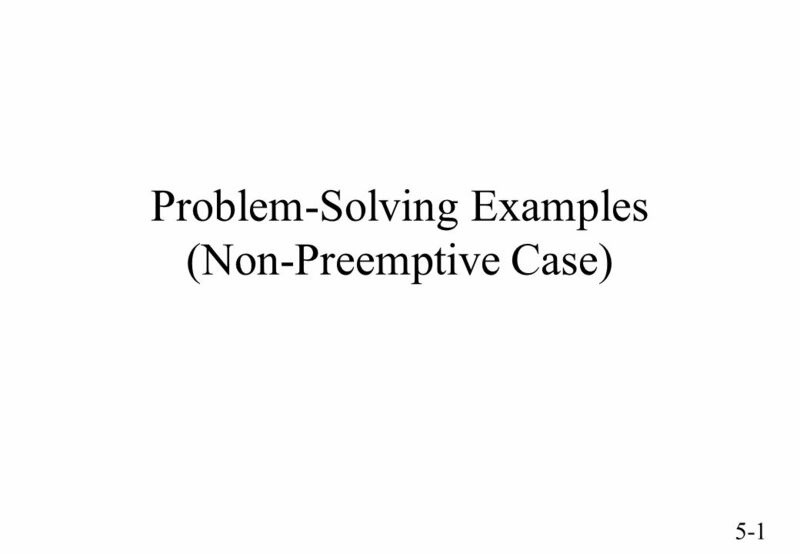 (If there is no choice point left, report that there is no problem solution and exit.) 5Upon backtracking, mark the backtracked activity as not selectable as long as its earliest start and end times have not changed. Then goto step 2. 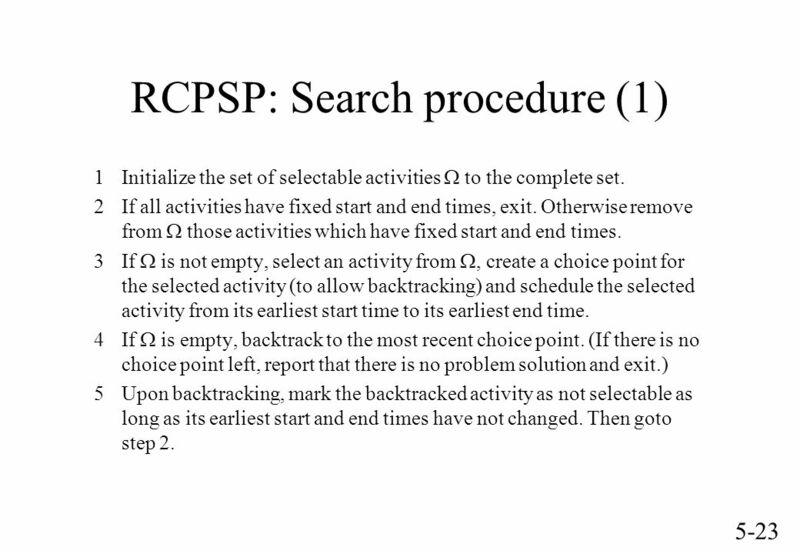 24 5-24 RCPSP: Search procedure (2) 1Initialize the set of selectable activities  to the complete set. 2If all activities have fixed start and end times, exit. Otherwise remove from  those activities which have fixed start and end times. 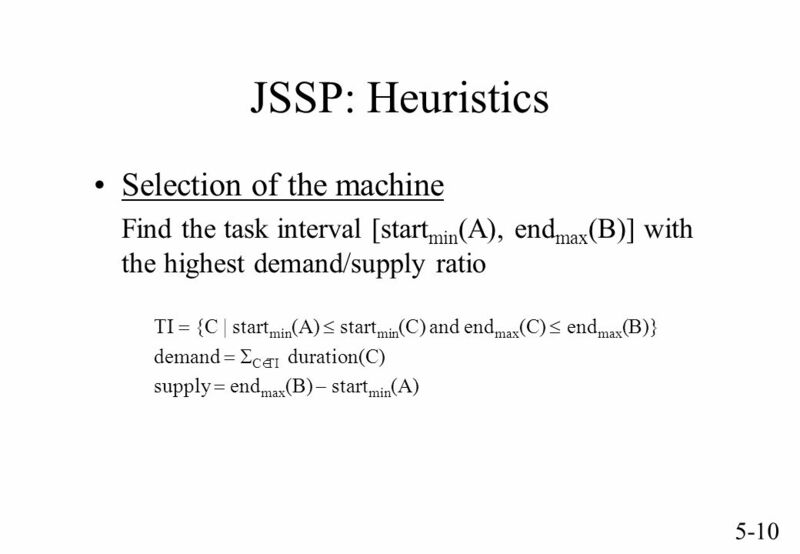 3If  is not empty, select an activity from , create a choice point for the duration of the selected activity, select a duration, create a choice point for the start and end times of the activity and schedule the selected activity from its earliest start time to its earliest end time. 4If  is empty, backtrack to the most recent choice point. (If there is no choice point left, report that there is no problem solution and exit.) 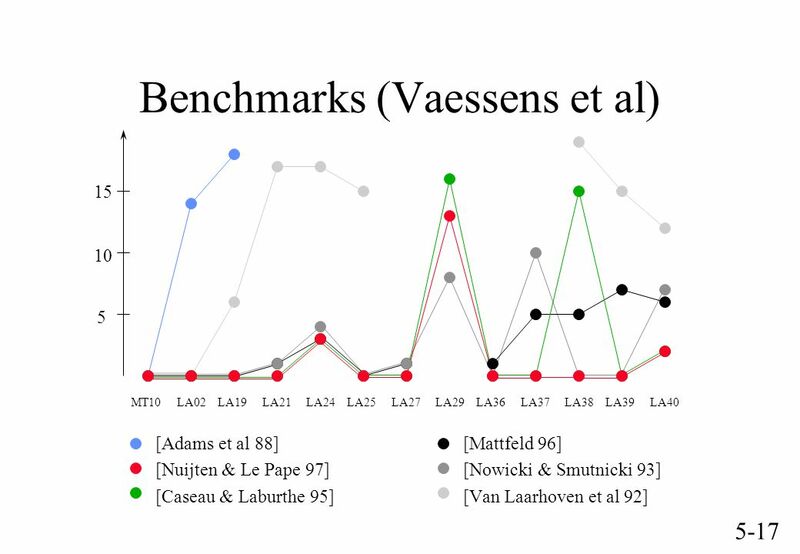 5Upon backtracking on a start/end time choice point, mark the backtracked activity as not selectable as long as its earliest start and end times have not changed. Then goto step 2. 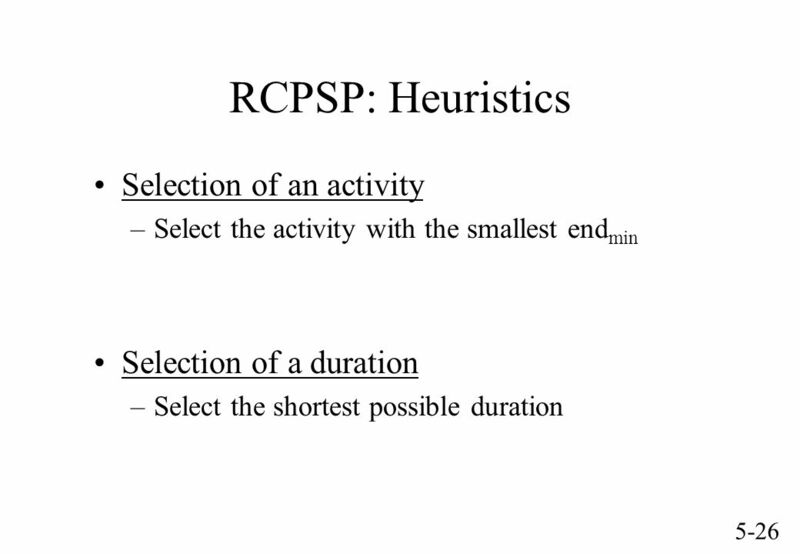 6Upon backtracking on a duration choice point, select another duration. 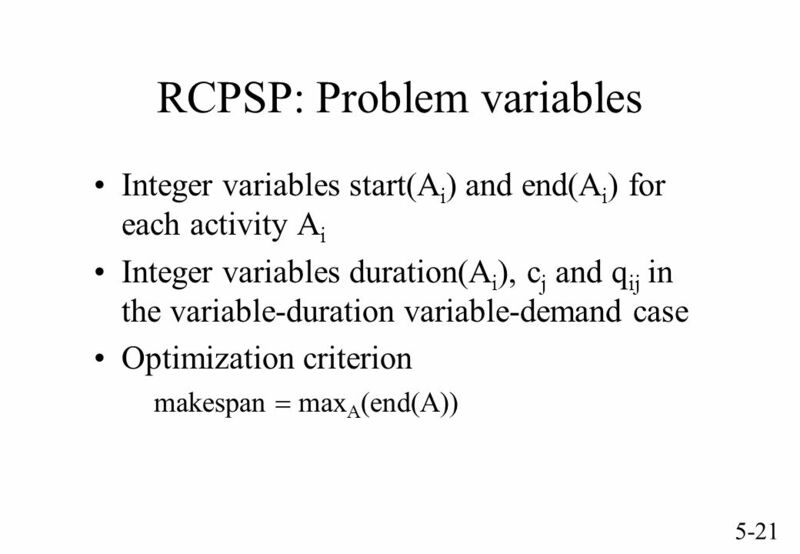 25 5-25 RCPSP: Optimization Classical minimization scheme Pareto-optimization (find all Pareto-optimal tradeoffs) 1Generate a solution which minimizes the first criterion c 1. (If there is no solution, exit.) 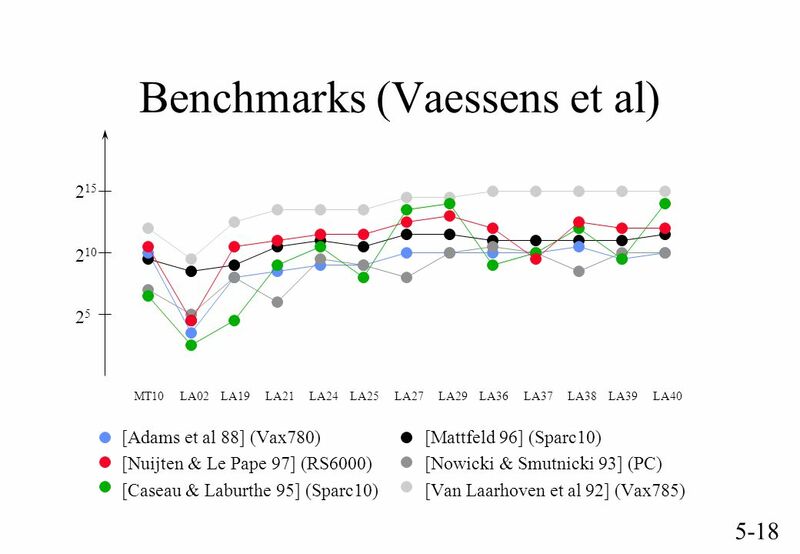 Let v 1 be the optimal value for c 1. 2Constrain c 1 to be smaller than or equal to v 1. 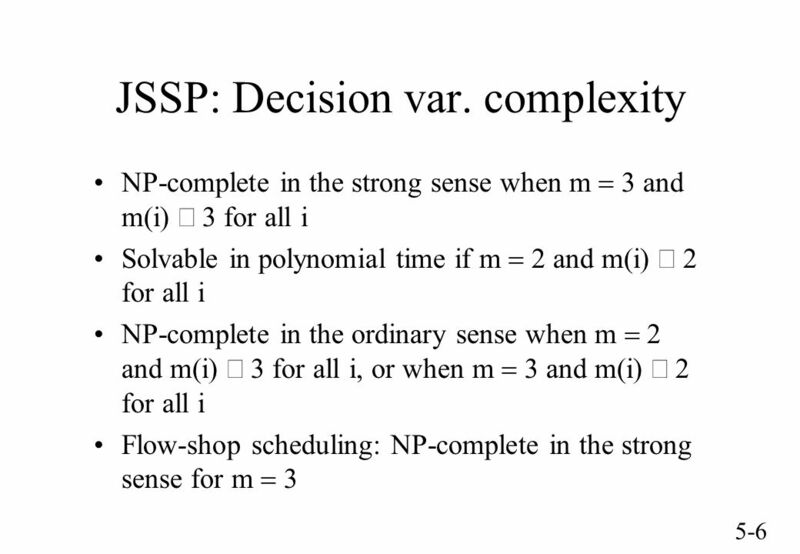 Generate a solution which minimizes the second criterion c 2. 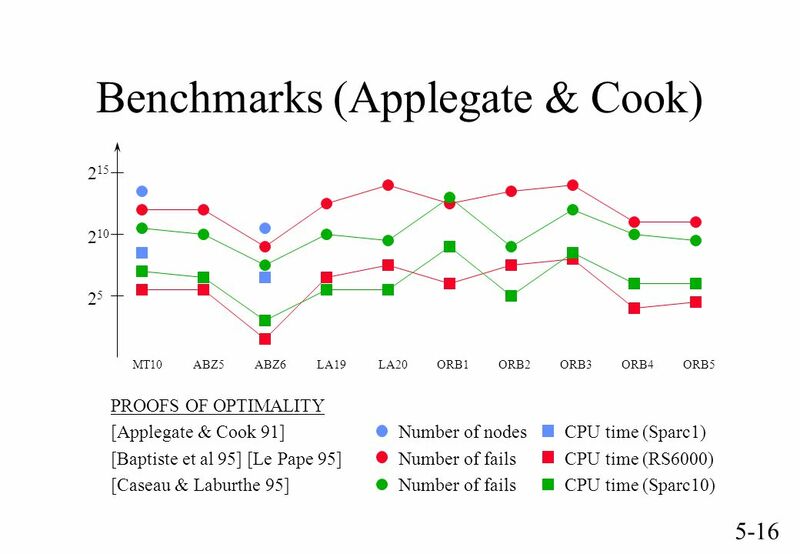 Let v 2 be the optimal value for c 2. 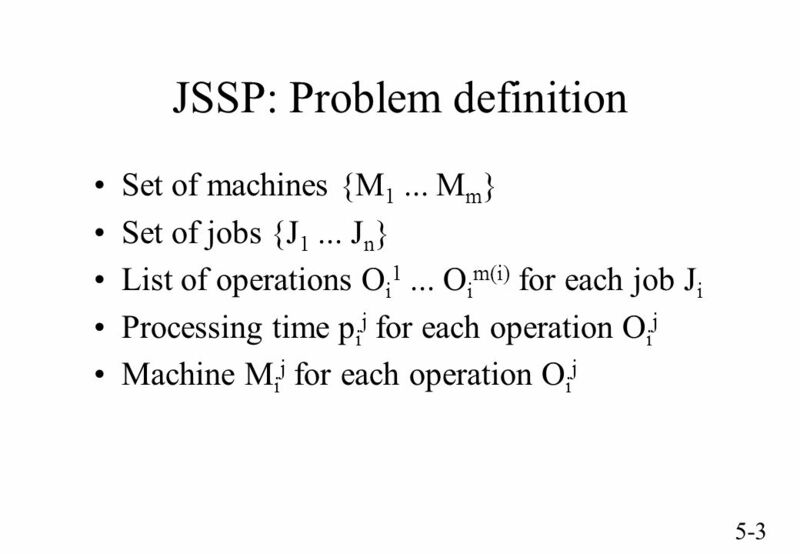 The solution found is Pareto-optimal. 3Remove the constraint stating that c 1 is smaller than or equal to v 1. 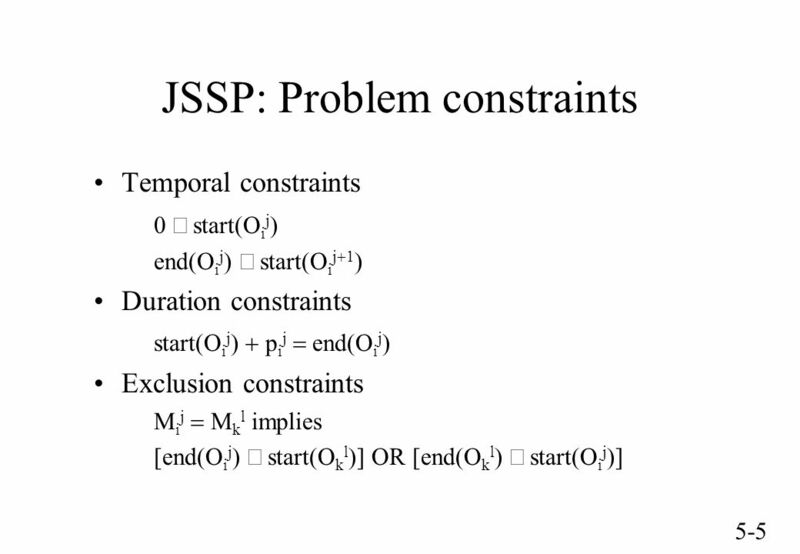 Replace it by a constraint stating that c 2 is strictly smaller than v 2. Goto step 1. 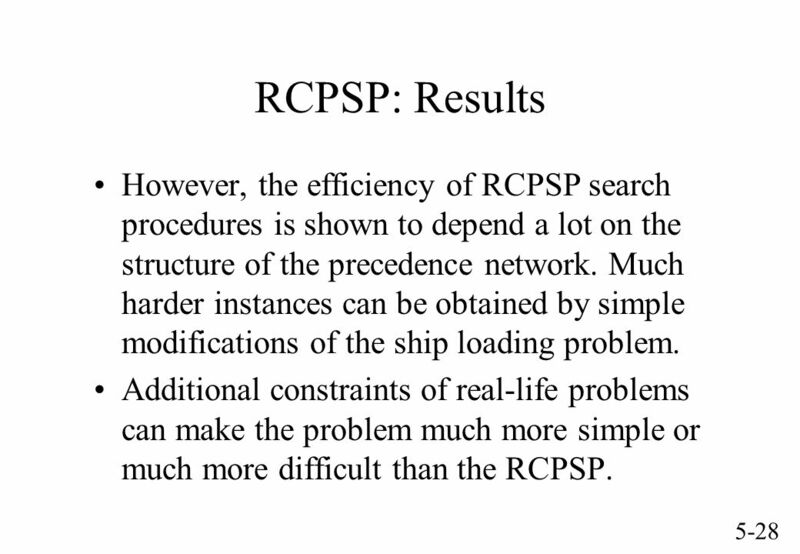 28 5-28 RCPSP: Results However, the efficiency of RCPSP search procedures is shown to depend a lot on the structure of the precedence network. 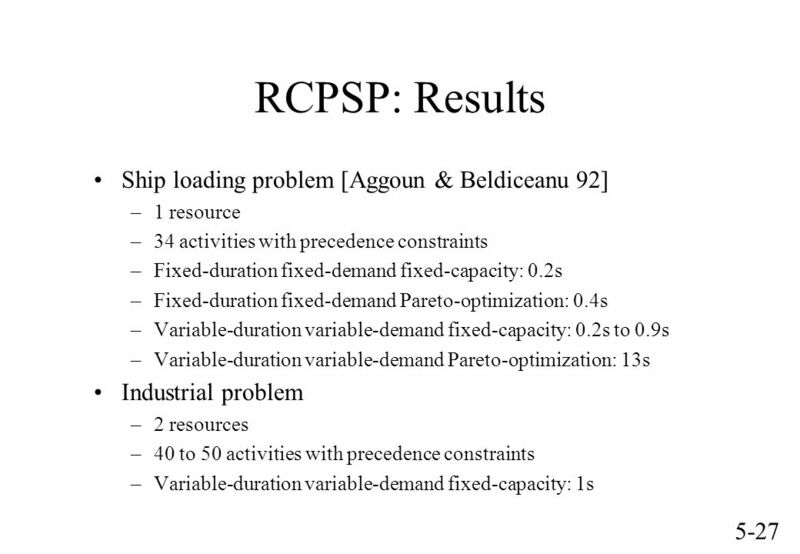 Much harder instances can be obtained by simple modifications of the ship loading problem. 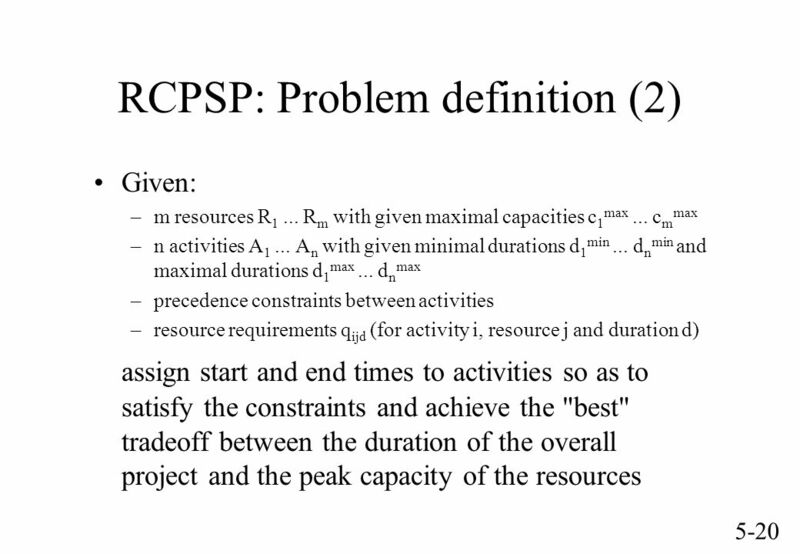 Additional constraints of real-life problems can make the problem much more simple or much more difficult than the RCPSP. 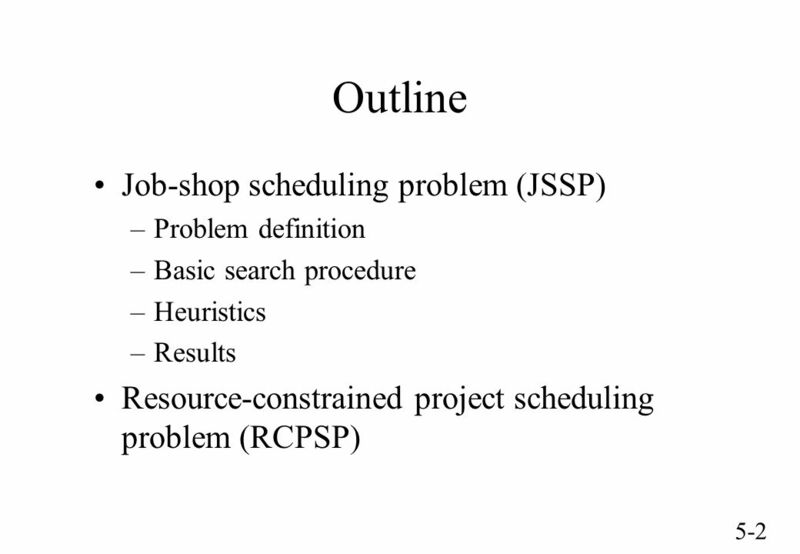 Download ppt "5-1 Problem-Solving Examples (Non-Preemptive Case)"
Vehicle Routing & Job Shop Scheduling: Whats the Difference? 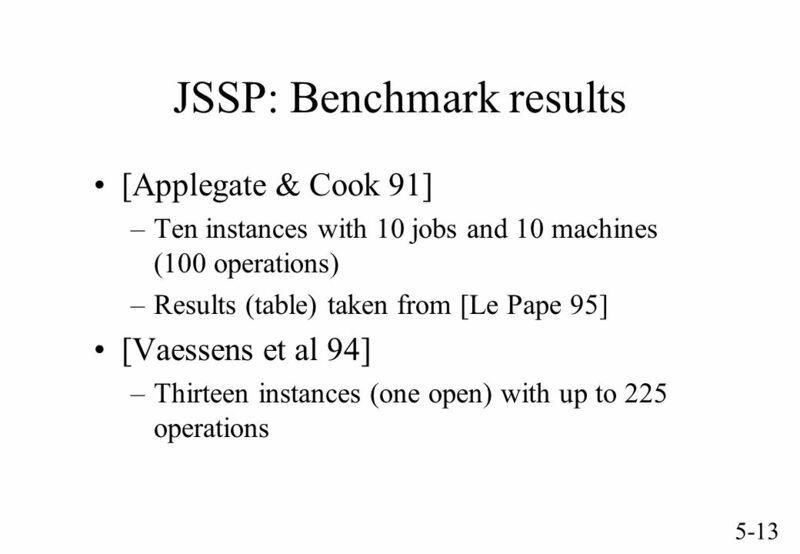 ICAPS03, June 13, 2003 J. Christopher Beck, Patrick Prosser, & Evgeny Selensky Dept. 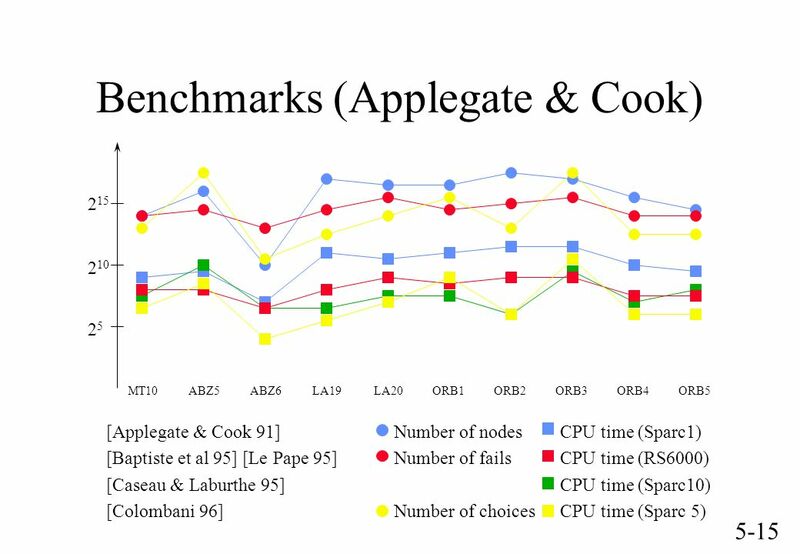 of Computing.